(CNN) -- "Killer apps," so the technological jargon goes, can transform the fortunes of businesses while improving the lives of the people that use them. But very few can claim to improve the worldwide provision of healthcare. Aydogan Ozcan is confident his lens-free cell phone microscope can do just that, creating an application that is a "lifesaver" in the truest sense of the word. "Our main goal is to replace bulky optical microscopes with computer codes and architectures that can make them extremely lightweight, compact and cost effective," Ozcan said. The associate professor of electrical engineering, who heads his own research group at the University of California in Los Angeles (UCLA), has been working on his microscope since 2007 with the aim of improving the detection of killer diseases like malaria and tuberculosis (TB). Traditional hi-tech optical microscopes can cost hundreds of thousands of dollars to buy. 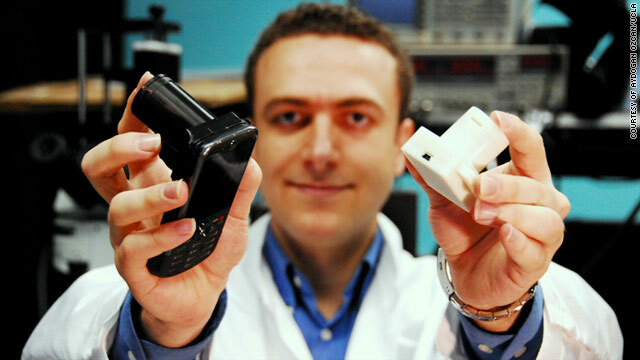 In contrast, Ozcan's invention, which makes use of the silicon sensor found in cell phone cameras, could cost as little as $5-10, he believes. LUCAS (Lensless, Ultra-wide-field Cell monitoring Array platform based on Shadow imaging) clips onto to the back of a standard cell phone (minus its lens) and comprises of an LED light, a spatial filter, and a slot for a medical slide. It works by passing light through a slide sample which creates shadows of individual cells on the phone's digital camera sensor positioned below. This image is actually a hologram, Ozcan says, and looks "a little weird and blurry," but can be deciphered by specially-programmed computers which translate the interference patterns captured on the sensor into data which can be read by medical staff. Image quality is improving all the time and progress in recent months has been rapid. "Currently we are at submicron, which means that our resolution is better than one millionth of a meter," he said -- which is sufficiently powerful to reliably image the malaria parasite. It's a massive breakthrough and could herald a radically different future in the detection of a treatable disease which killed around one million children in 2008 and is responsible for one fifth of all childhood deaths each year, according to the World Health Organization (WHO). Furthermore, Ozcan says, it will help a disease which suffers from the burden of false positive tests. In some countries this figure is as high as 70%, he says. "We need to put a technology together that will either train healthcare workers better or bring in a technology that would assist them to make fewer errors," he says. He's not advocating the replacement of technicians altogether, that would be too dangerous, he argues, but rather provide them with equipment which allows them to make accurate decisions faster, so they can screen more slides per day. With the aid of funding from the U.S. National Institute of Health Ozcan and his research team are preparing to test the device in the field. The first trials will get underway at malaria clinics in Brazil later this year. "It will be useful for the students to solve some of the issues which we haven't thought of yet," Ozcan said. With proper financial backing he believes an initial product could reach the market in as little as 18-24 months. Improved devices which can match the performance of existing optical microscopes are not far away either, he says. Pathogens and bacteria are typically very small, Ozcan says, requiring a very high resolution. TB, for example, requires a detection resolution somewhere between 0.2 and 0.4 microns. "Currently we can see clusters of TB, but individual cells are a little difficult," he says. By the year's end he's confident that LUCAS and a new florescent microscope in development will have advanced enough to allow for reliable detection of TB bacteria, monitor the white blood cells of HIV positive patients and assist in the prevention of waterborne diseases, which collectively claim the lives of over five million people each year, according to WHO. Ozcan's research has already earned him a clutch of awards, most recently the 2011SPIE (The International Society for Optics and Photonics) Early Career Achievement Award and the backing of the Bill and Melinda Gates Foundation. But the 32-year-old remains modest about his achievements so far, crediting the advances of the consumer electronics market with allowing him to invent such a device. Ten to 15 years ago all this would not have been possible, he says. "We are very grateful to those five billion cell phone subscribers because they are the motivation for cell phone companies to make components extremely inexpensive," he said. "The same is true for Xbox players and the gaming industry. Thanks to them we can get our hands on phenomenally complex supercomputers, inexpensively. "In 2007, it was a very interesting problem, scientifically. But I couldn't fully grasp it or get the passion I have today. It's much bigger than we could have guessed four years ago. Today is just the tip of the iceberg."